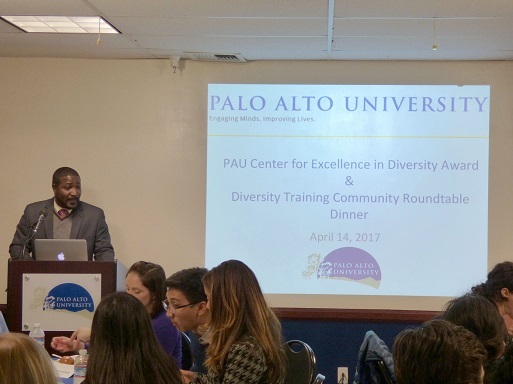 The Center for Excellence in Diversity at Palo Alto University hosted its annual Excellence in Diversity Award Dinner at PAU on April 13, 2017. Attendees included Palo Alto University students, faculty, staff and representatives from local practicum organizations, including: Asian Americans for Community Involvement (AACI), Mills College Counseling Services, Partnerships for Trauma Recovery, East Bay Agency for Children and Treasure Island Job Corps. 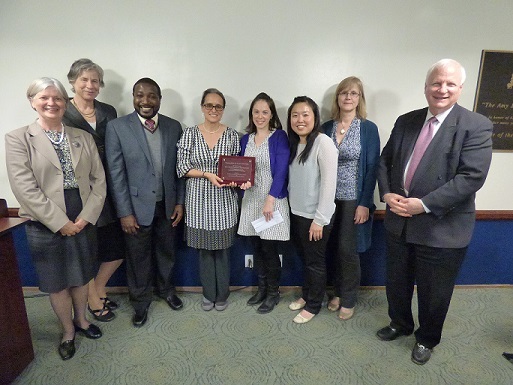 During the dinner, the Center for Excellence in Diversity Award was presented to Partnerships for Trauma Recovery for their outstanding work in facing the challenges of diversity. In addition to the award presentation, the event included round table discussions on how to foster meaningful dialog to help nurture tolerance, acceptance, inclusion, and peace in the current political and cultural climate. By the end of these discussions, attendees shared an inspiring Affirmation Statement confirming their deep commitment to diversity.